Have you heard of Ask.fm? 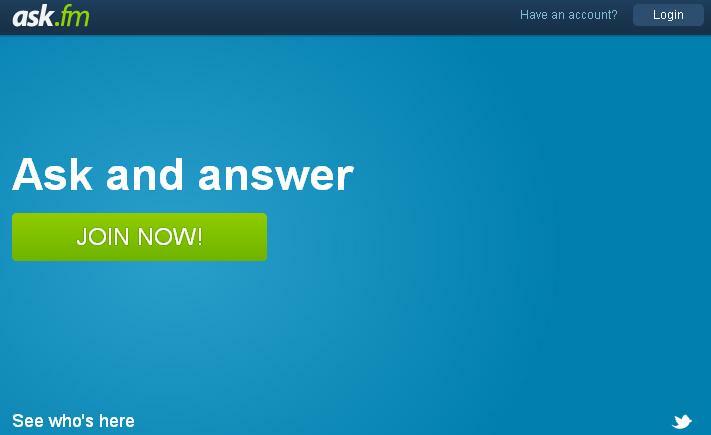 Ask.fm is an online social Q&A website. The site was founded in June 2010. The company is based in Latvia in Northern Europe. The site is very popular in Europe and is rapidly increasingly in popularity here in the America. The basic premise of Ask.fm is very simple and seems innocent enough. You create an account, you ask people questions and they ask you questions and you reply to each other. Here is the problem, questions can be asked anonymously. The site is an ever increasing hub for cyber bullying. So far, the site is linked to 4 suicides as a result of the bullying that kids received on the site. I know, there must have been some other issues in the lives of these kids (and not just bullying on a website) that caused them to take their own lives. I Know, Ask.fm is just a tool. I know, kids will be kids. My point is, why even invite that potential EXTRA problem into your lives by allowing your children to use Ask.fm? At least monitor your children, be engaged, and know what’s going on. Life is tough enough. Don’t ASK for trouble. This is great information! You always find valuable sites! Thank you very much. I’m just trying to do my part to help people.